1989 24 Heures du Mans Race Poster. June 10 & 11, 1989. The 1989 Le Mans poster is part of the "The star car used for sponsorship" era in Le Mans posters which lasted from 1981 to 1997. In 1989, Mercedes was back at Le Mans after an absence of 34, following the tragedy of 1955. 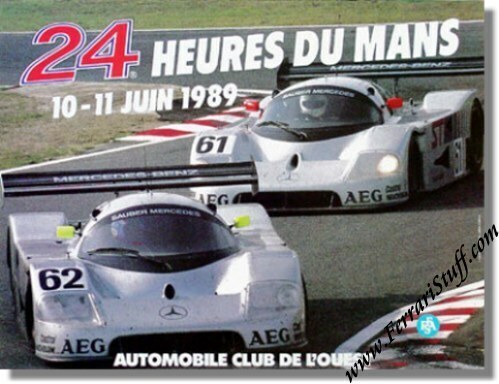 Design of the 1989 Le Mans poster was again in the hands of the S. Conseil agency and is based on a color photograph of the Nr 61 and 62 Sauber Mercedes C9's during practice. The only one of the trio of entered Silver Arrows missing on the poster is the Nr 63 that would actually win the race. The race was won by Jochen Mass, Manuel Reuter & Stanley Dickens in their # 63 Sauber Mercedes C9 with a total of 389 laps to their name. For the full results of this race, please see 24 Heures du Mans results 1989.